Recently I included a page on Stonebow House. In its iconic ugliness it perhaps distracts attention from other less startling erections of the period. Like one just down the road, on St Saviour’s Place. Hilary House, from the end of St Saviourgate. Framed by, looming over, the handsome buildings of that street. Let’s see if it looks better with some blue sky behind it. No, not much. Round the back on Aldwark it looks far worse. Here’s a photo taken in 2004, from Aldwark, over the top of a wheelie bin. Normally I’d try to avoid getting a wheelie bin in the photo, but in this case it didn’t seem to matter. Just look at it, with its forlorn car park and the Minster peering over the buildings in the background, looking shocked. I think at the time I thought that the plastic tube thing was an indication that they were demolishing the place. Sadly not. 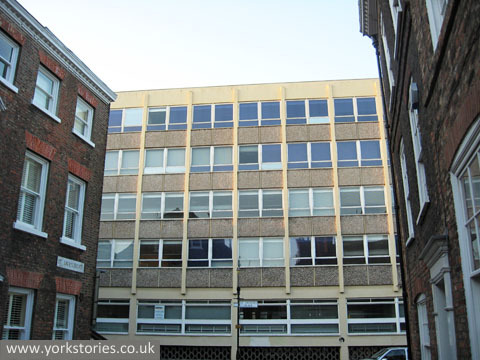 Hilary House was built in 1964, before Aldwark was remodelled into a desirable residential area with carefully planned housing filling the gaps between historic buildings. It arrived on the scene when this area was fairly run down and industrial, so perhaps it didn’t matter then that its Aldwark side is so utterly charmless — sudden area of car park, complete with concrete bollards, concrete planter, opening out from the otherwise handsome street frontage into sudden ‘ah, sod it’ streetscape. Back on St Saviourgate, its front view, where it looks a little better in bright sunlight in March, but then everything does. 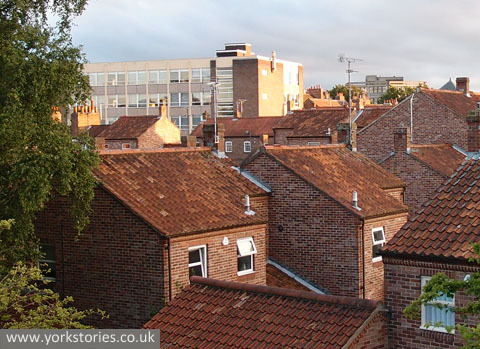 From the city walls, the stretch between Monk Bar and Layerthorpe, the most dominant intrusion is not Stonebow House, but Hilary House: that big block sticking up over these carefully integrated houses. Stonebow House behind, just visible. 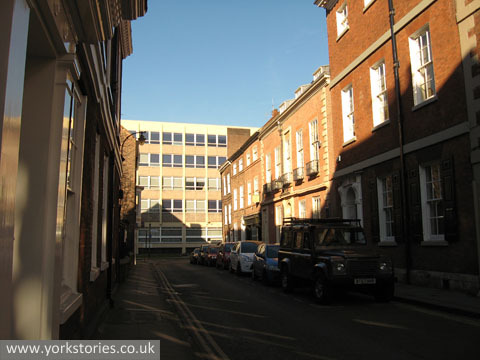 Until Hilary House was built in 1964 the buildings at the end of St Saviourgate framed a massive chapel frontage with tall columns. It was designed by J P Pritchett (who also designed the far more beautiful York Cemetery chapel, and the lost deanery in Dean’s Park). By the 1960s many of those nonconformist chapels built in the 19th century had outlived their usefulness. Looking around the city now, in 2013, it seems the same might be said of large office blocks like Hilary House, apparently empty now. I think it’s always better to reuse buildings rather than demolish them, but if Hilary House disappeared I really wouldn’t mind. Would anyone? J. G. L. Poulson Ltd., architects, Pontefract, catalogue records from National Archives. 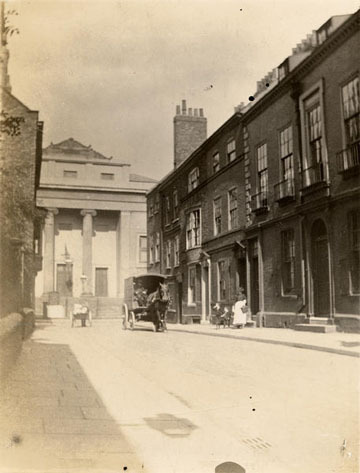 Includes several references to York properties, including St Saviour’s Place (aka Hilary House) and gas board premises on Davygate, also designed by Poulson (since demolished, replaced by Panter Hudspith development (pdf)). 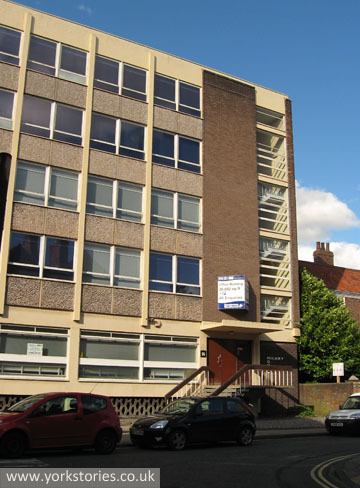 Hilary House is included in the City of York Office Stock Availability reports and has a Grade C rating. I’m not an expert but I think that means it’s not top of the range office space. Well, I wouldn’t miss it. I wonder about what would replace it though. Probably something bland and cowardly that didn’t offend the eye (or the Civic Trust). – which is clearly never going to happen, but for a minute it was nice to imagine it. Maybe as cars are so unwelcome now any new development could use the former car park area and spread out, meaning it wouldn’t have to be so out of scale massive. To buck the trend. I like it! But I do love the brutalist style of 60’s architecture. My basic feeling is, the late 50s-60’s-early 70’s were a modern view of a cleaner approach to form, and there is an optimism for a dynamic future in the simple forms. In Montreal theres a lot of more moderns 90’s 00’s buildings that are really not aging well because they are, for want of a better term, trying too hard, visually. But this said. I love the more ancient architecture, Victorian and Edwardian too. I feel, you can have ‘good’ brutalist architecture and ‘bad’ brutalist architecture. This building is definitely less interesting as Stonebow House, but it fills some requirements for me. But, agreed on many levels it fails to inspire or romanticize like the older buildings around it. For some reason the fourth photo reminds me of that famous mid-C20th photo of the ship sailing by the end of a terraced street. I think it was taken in Sailortown, Belfast but I might be wrong. It’s like the 20th century in transit through the older streets of York, failing to anchor itself properly. I agree with Paul re: good versus bad brutalist architecture, there was a nobility of spirit about the original intention but so often in Britain it was seen as a means of saving money rather than producing buildings of lasting worth. I’ve a soft spot for Park Hill in Sheffield, the problems which arose with it were not caused by the design or initial build but a failure of proper upkeep. So pleased it’s had an urban splash makeover and is a coveted place to live again. I remember sitting in my flat on the hills of S11 writing at a big window into the early hours watching the lights go out one by one at Park Hill across the valley. 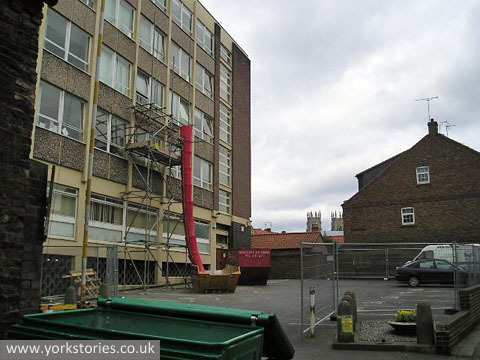 I actually like it, in the way I like Stonebow house…as long as I’ve known York its been there, lurking and empty. I wouldn’t like them to put something else there which is worse, one day the 60s will be like the Victorian age and before…unappreciated by the people of the time but of historical value in the end. Maybe.